question_answer1) Which pouch has more money than others? question_answer2) What is the amount of money shown? question_answer3) Study the given information. How much money does Bala have in his kiddy bank after 4 days? question_answer4) Which set of money is enough to buy the toys shown? question_answer5) Write down the total value of the coins shown. question_answer6) A housewife bought a bouquet of flowers which costs Rs. 42. If she gave the cashier a Rs. 50 note, how much change would she receive? question_answer7) Sudhir bought a pair of jeans for Rs. 40 and a shirt for Rs.15. Find the change he should receive if he gave the shopkeeper a Rs.100 note. question_answer8) A man earned Rs. 425 per week while his wife earned Rs. 115 less than him each week. Find how much they earn altogether each week. question_answer9) A man bought a computer for Rs. 2175 and a television set for Rs. 925. How much more did he spend on the computer? question_answer10) Which of the following is the same as Rs. 15? question_answer11) Sakshi saved Rs. 3 per day while her sister saved Rs. 1 more than her per day. Find their total savings in 7 days. question_answer12) A man bought a watch for Rs. 240 and 2 pairs of shoes at Rs. 325 each. How much change should he receive if he gave the shopkeeper a Rs. 1000 note? question_answer13) A housewife bought 3 pairs of skirts at Rs. 165 each. Find the total amount of money she spent. question_answer14) A toy plane costs Rs. 8 and a toy boat costs Rs. 7. Find the total cost of 3 toy planes and 2 toy boats. question_answer15) Each pupil in class 2 donates Rs. 4 to the school welfare fund. How many pupils are there if they collected Rs. 72 altogether? question_answer16) Anita spends Rs. 3 a day. How much will she spend in a week? question_answer17) A man bought 2 books for Rs. 100. Find the total cost of 5 such books. question_answer18) A box contains 10 pencil cases. There are 7 pencils inside each pencil case. How many pencils are there in all? question_answer19) 4 books cost Rs. 96. Find the cost of each book. question_answer20) A boy saves Rs. 56 in 7 days. How much does he save each day if he saves the same amount daily? question_answer21) Aman bought 2 shirts for Rs. 396. How much should he pay for 6 such shirts? question_answer22) 3 bags cost Rs. 54 while 4 books cost Rs. 64. By how much is the cost of a bag more than that of a book? question_answer23) Manoj bought two items for Rs. 34. 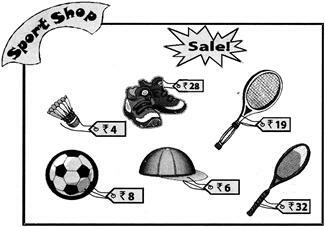 Identify the items bought by Manoj. question_answer24) Varun bought a cap, a pair of socks and a ball. He pays with a Rs. 50 note. How much change does Varun get? question_answer25) Find the total amount shown. question_answer26) How much do 6 oranges, 5 bananas and 4 pineapples cost? question_answer27) Sunil bought 4 cricket balls and 3 tennis balls. Mayur bought 2 rugby balls and a football. How much money did they spend in all? question_answer28) How much cheaper is the handkerchief than the umbrella? question_answer29) Which of the following is the costliest toy? question_answer30) Kiran has Rs. 50 with him. Which of the following can he buy? question_answer31) Raju has Rs.100. How many such toys as that shown can he buy with the money he has? question_answer32) Murali gave Rs. 50 to buy this toy car. How much change will he get? question_answer33) Alt wanted to take a change for Rs. 10. Which set of coins should he take? question_answer34) Study the given table. question_answer35) Suresh bought 3 pens for Rs. 6 and 2 books for Rs. 12. How much should he pay the shopkeeper? question_answer36) Eesha gave Chitra some Rs. 5 coins. Chitra spent 31 of them and returned the remaining 29 coins to Eesha. How much did Chitra give Eesha? question_answer37) Find the amount the same as the amount given in the box. question_answer38) Study the prices of the items given in the box. Which two items have their prices less than Rs. 50? question_answer39) Bhaskar has Rs. 18. He wants to buy 4 pencils. Each pencil costs Rs. 6. How much more money does he need? question_answer40) Suresh has two Rs. 1 coins, three Rs. 2 coins, five 20 p coins and four 50 p coins. How much money does Suresh have?